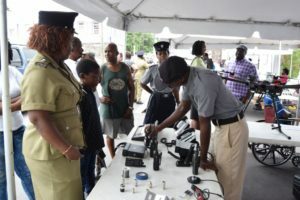 Basseterre, St. Kitts, August 18, 2017 (SKNIS): Hundreds of persons traversing Bank Street in Basseterre got a better sense of the various units and capabilities of the Royal St. Christopher and Nevis Police Force (RSCNPF) as the agency staged a Career Fair on Friday, August 18. The tactical unit booth was the most popular with locals eager to learn more about the weapons and tools, including riot gear, tear gas rounds, shot guns, ammunition and other items on display. Demonstrations by the K-9 Unit kept the audience buzzing as Officer Castor guided by his handler staged mocked searches for guns and performed take downs of suspects. Other booths included the Crime Scene Unit; investigative units featuring the Criminal Investigations Department, Special Victims Unit and more; Traffic Department; Telecoms, and others. The agency’s Force Personnel Officer, Clifford Govia, coordinated the event. He said that there is a plan to expand the manpower from 435 to about 485 and as such a special appeal was being made to persons between the ages of 18 and 35 years to join the RSCNPF. Mr. Govia said St. Kitts and Nevis has grown significantly over the years and so too has the number, types and sophistication of crime. The RSCNPF also had to change to keep pace as it strives to enhance public safety. A number of civilian posts are also available, particularly in the Telecoms Division, which needs persons to monitor the Closed Circuit Television (CCTV) cameras, operate surveillance drones, maintain and repair computers and police radios, and a host of other jobs. Assistant Commissioner of Police, Merclyn Hughes, said in addition to educating the public about career opportunities available in law enforcement, it also helps to humanize the men and women charged to serve and protect. 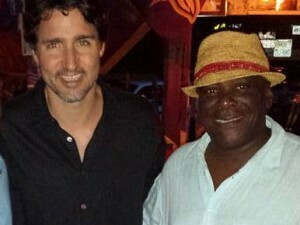 “We want the community to recognize that we are part of them. We come from among them; we want to work with them; we want them to work with us and so today we are here on show so that persons can come see what The Police is all about,” she stated. ACP Hughes added that she was pleased to see so many persons stop by to interact with the officers at the different booths.